EastCoast Entertainment (ECE) is excited to announce our exclusive representation of The Second City Touring Company. The Second City has established itself as a Chicago landmark and a national treasure, bringing laughter and joy to packed houses all over North America, since 1959. We are thrilled to represent them during their upcoming 50th Anniversary Tour and for years to come. "ECE Touring is very excited to exclusively represent The Second City during this momentous year in their history. We want to wish them a Happy 50th Anniversary and hope their fans, old and new, will seek them out at one of their public performances around the country and enjoy the special presentation they have put together to celebrate their 50th," said Lee Moore, Executive Managing Director of EastCoast Entertainment. 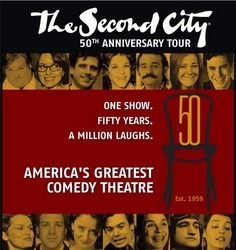 Second City is the country's preeminent comedy theater with such notable alumni as: Alan Arkin, Fred Willard, John & Jim Belushi, Harold Ramis, Bill Murray, Chris Farley, Bonnie Hunt, Tina Fey, Mike Myers, Steve Carell, Stephen Colbert and more. Representing more than 10,000 entertainers and artists across the country, EastCoast Entertainment successfully operates and books entertainment in all 50 states and internationally for private group and social events, as well as for corporate functions, national tours and public-ticketed events. ECE maintains an impressive line up of exclusive and non-exclusive performers. A recent sampling of acts performing for ECE clientele includes high-profile, national acts such as Tony Bennett, Hootie and the Blowfish, Steely Dan, and the Harlem Gospel Choir. Non-musical headliners include Jeff Foxworthy, Kevin Pollak, Bill Cosby and Richard Lewis. ECE also provides a broad array of the most successful and sought-after party bands in the country. EastCoast Entertainment is the largest, full-service entertainment agency in the country, arranging entertainment and producing events from coast to coast and around the world. The Company operates ten offices and delivers the largest direct resource of exceptional talent and quality production services in the industry. ECE's mission is to make every celebration an unforgettable experience by combining client-centered business practices with world-class talent and comprehensive event production services. For more information on The Second City Touring Company or EastCoast Entertainment please contact Kris Kaminski at 800-277-6874 or visit our website.